In 1989, Swarovski was near the end of the first SCS trilogy, “Caring and Sharing”. The final SCS figurine in this series was the Swarovski Turtledoves, by Adi Stocker. The Swarovski Turtledoves could be purchased only in 1989 by Swarovski SCS members. 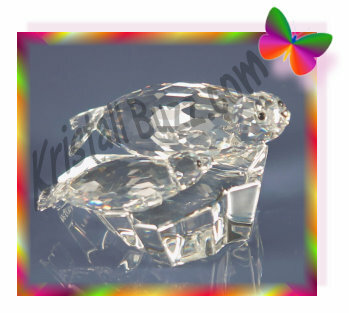 The Swarovski Amour Turtledoves is approximately 3.5” long. 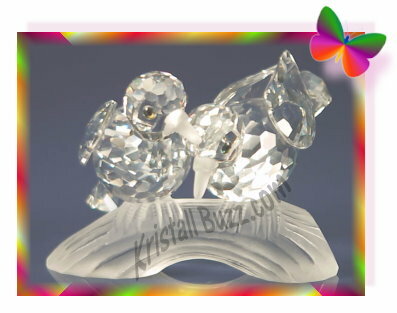 From a quick description of this crystal figurine, they might sound like the Swarovski Lovebirds: 2 amorous clear birds with frosted beaks, perched on a frosted branch. The ‘backstamp / bottomstamp’ is found on the side of the Turtledoves branch, where the branch is clear, (as it is quite difficult to see on frosted crystal, like on the Swarovski Woodpeckers). The backstamp, consisting of the Swarovski Swan, the letters SCS, the designer’s initials “ASt” and the year “89”, is easily visible. The Turtledoves are identified using the Swarovski part number DO1x891 or the system number 117 895 was revealed. It is interesting to note that the SCS Turtledoves crystal component for the birds’ wings is the same component used for the wings on the Swarovski Woodpeckers and the ears on the 1990 Swarovski Dumbo figurine! The crystal giant has also produced one other Turtledoves design, by a different designer Gabriele Stamey. This more recent Swarovski Turtledoves figurine was introduced in 2004 and can presently be purchased in the Swarovski shoppe. The most striking differences between the Amour Turtledoves and Silver Crystal Turtledoves are the frosted beaks (SCS AE)vs topaz beaks (Silver Crystal) and resting birds (SCS AE) vs a bird with its wings spread (Silver Crystal). Also, the SCS AE Turtledoves are a bit smaller 3.5” long vs 4.25” for the newer Silver Crystal design. A special thanks to Jane Warner for consultations made during the writing of this Swarovski Turtledoves article. Jane is the Swarovski expert author of Warner’s Blue Ribbon Books on Swarovski. In 1989, the MSRP of the SCS Swarovski Turtledoves was for $195 USD . 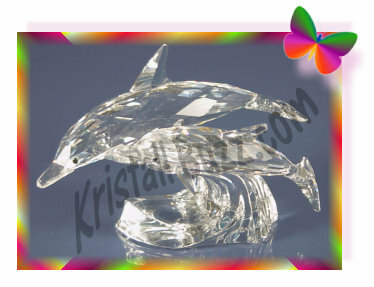 Just like the other ‘Caring and Sharing’ figurines, the purchase price included the crystal figure, a custom box for the Turtledoves, and a Swarovski COA (certificate of authenticity). Collectors who want to purchase the Swarovski Turtledoves from a Swarovski expert dealer, like Crystal Exchange America, should expect to pay $550 – $650 for the SCS Turtledoves in mint condition with original box and certificate. The Swarovski Woodpeckers were available for purchase only in 1988 for collectors who were members in the Swarovski SCS. In the last article about Swarovski Woodpeckers, the most common variation was the focus of the article. In the previous article, it was not mentioned that Swarovski released 2 different versions of the Swarovski AE. However, this article will expand on the Woodpeckers variations and what makes them unique. Displaying the two variations of SCS Woodpeckers side-by-side, it is not possible to distinguish the variations. While there are often great differences in the positioning of the birds and how close or far apart the mother beak is from the baby beak, this is not what makes them unique. To identify the variations, one must look at the very bottom of the figurine where the backstamp is located. The Woodpeckers ‘Sharing’, variation 1 (as it is referenced in Warner’s Blue Ribbon Books on Swarovski) has a frosted base. The bottom side looks a lot like the trunk as it is not possible to see into it. The backstamp is difficult to see as it too has a frosted-like appearance. The Woodpeckers ‘Sharing’, variation 2 (as it is referenced in Warner’s Blue Ribbon Books on Swarovski) has a clear base. The bottom side is clear, just like the top of the trunk that the birds are attached to. The backstamp is easy to see as it has a frosted-like look. (Remember, the backstamp is the year of the Woodpeckers “88”, and the designer’s (Adi Stocker) initials “A St”. Both 1988 Swarovski Woodpeckers were known using the Swarovski part number DO1X881 and system number 014 745. Swarovski did not assign unique numbers to them even though they were different. Furthermore, it was not possible to order a specific variation, and for the most part the variations went undocumented for many years. Some Swarovski Crystal Fanatics make the mistake of looking at the top of the trunk and become excited seeing a clear top, thinking that the bottom will be clear too. This is not the case. ALL Woodpecker trunks are clear on the top, so when looking at the trunk to determine the variation, it is the bottom that must be examined. So why are there differences in the trunk base? According to a former employee, the SCS Woodpeckers were supposed to have a clear base. But something did not go as planned during manufacturing, and the trunks had to be, more or less, ‘filed’ to make the bottom smooth and allow the Woodpeckers figurine to stand upright. The next step should have been to re-polish the trunk base to restore it to its original intended design. But that did not occur….the trunks were ‘backstamped’ and used as is. 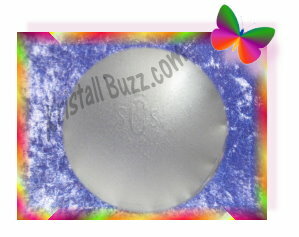 So, in short, the filing the base and leaving it with a frosted-like appearance was a corrective action taken when the bases did not come out of the mold process ‘just right’. A special thanks to Jane Warner, co-author to Warner’s Blue Ribbon Books on Swarovski for consulting on the articles about the second SCS Annual Edition exclusively for SCS members: the Swarovski Woodpeckers. In 1988, the SCS Swarovski Woodpeckers retailed for $165 USD. 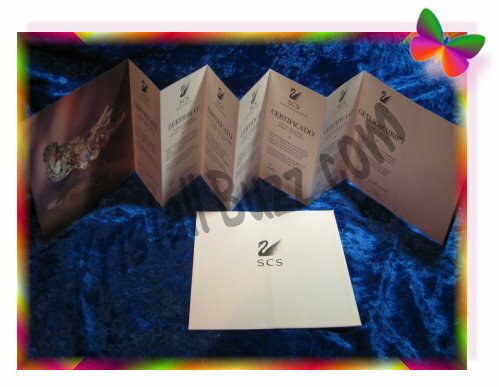 For this price, the SCS member received the crystal figurine, an octagon-shaped display mirror with a Swarovski logo, an SCS custom box for the figurine, and a Swarovski COA (certificate of authenticity). While Swarovski Woodpeckers Variation 1 (Frosted Base), in mint condition, complete with mirror, and original packaging can usually be purchased on the secondary market for $1000 – $1400. Swarovski Woodpeckers Variation 2 (Clear Base), in mint condition, complete with mirror, and original packaging is much harder to and likely will cost $2500 – $2800 from Swarovski expert dealers, like Crystal Exchange America. At the present time, they have one Variation 2 Woodpeckers crystal figurine only (no box, no certificate, no mirror) at $1875 plus shipping. Personally, since they cannot be distinguished displayed on a shelf, I would have a hard time spending the extra $1,000 to get Variation 2 over Variation 1. 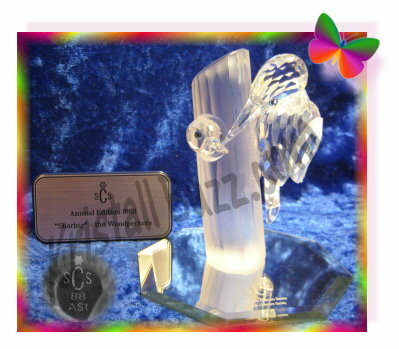 Following the Swarovski Lovebirds, the Swarovski Woodpeckers was the second figurine in the ‘Caring and Sharing’ series. The Woodpeckers ‘Sharing’, were available for purchase only in 1988 by Swarovski SCS members. By then, SCS membership had grown and was available in more countries than just the English-speaking ones. 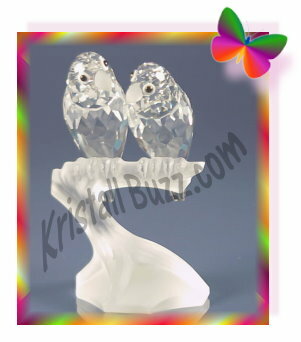 The Swarovski Sharing Woodpeckers stands just over 4” tall. 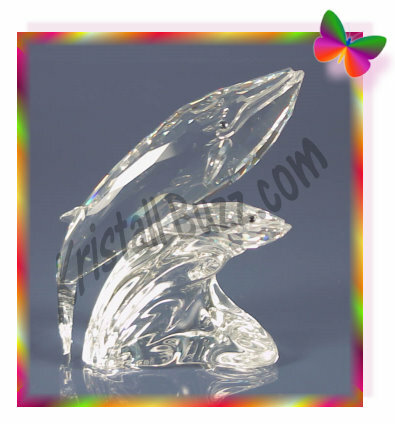 It is a figurine with 2 clear birds, attached a frosted tree trunk. The birds are a mother woodpecker (the bird with the full body) and a baby woodpecker, with its head peeking out of the tree. Since the figurines are hand-assembled, we often see the woodpeckers at various angles and proximity from each other. Sometimes the beaks are so close that you can barely slip a piece of paper between them, while other figurines may have the woodpeckers situated such that the beaks are nearly ¼” apart. Adi Stocker is the designer of the Swarovski Woodpeckers. The SCS Woodpeckers were the first SCS figurine he created with full credit from the crystal brand. Since that year, Adi Stocker has designed 4 other Swarovski AE figurines. The Sharing Woodpeckers contain the ‘backstamp / bottomstamp’, which is included for the sake of authenticity. Looking closely at the underside of the frosted tree trunk, the year “88” can be seen. Per Swarovski’s definition, the designer’s initials “A St” should be visible, but it must be very faint. The Woodpeckers were known using the Swarovski part number DO1X881, and when Swarovski began using system numbers for identification, 014 745 was divulged, so it can be identified using either number. Swarovski Woodpeckers, Black Diamond by Elisabeth Adamer. These Swarovski Woodpeckers, in the Paradise line, retires in 2012. Swarovski Woodpecker, Ziggy by Edith Mair. This Woodpecker, in the Lovlots line, was a limited edition figurine available in 2010 only. The SCS Swarovski Woodpeckers retailed for $165 USD in 1988. 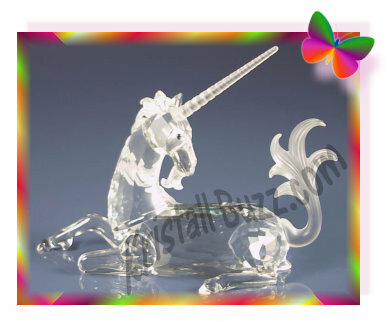 The purchase price included the crystal figurine, an octagon-shaped display mirror, a custom box for the figurine, and a Swarovski COA (certificate of authenticity). The Swarovski Woodpeckers, in mint condition, complete with mirror, and original packaging can usually be purchased on the secondary market for $1000 – $1400, from Swarovski expert dealers, like Crystal Exchange America.